You fail to see the humor in your daily ride on MARTA? Heck, why waste your time watching "reality tv" when you have a live freak show on the train. And it's cheaper than going to Amsterdam for the weekend! See our Online Store for coffee mugs, T-shirts and other novelty items that find humor in MARTA. And come back to this page as we will be adding photos and video of the humorous things we see on MARTA. For a start, gaze upon the distant image of "Tutu Man". This tall, 30-something black man can be spotted walking down West Peachtree near the North Avenue Marta station around lunchtime. If you look closely, you'll see he is wearing a pink tutu, a blond wig, tiara, and a cheerleader customer, complete with pom poms. And he's not advertising anything, aside from his own weirdness. When he tires of the tutu (maybe it chafes?) he can be spotted wearing a drum major's outfit and march to the beat of a decided different drummer, or his ever-popular Superman costume. 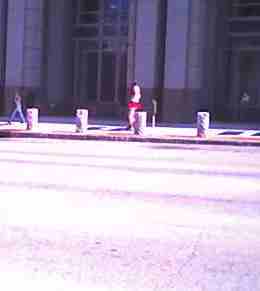 I'm sorry about the poor photo quality, but I only had my camera-phone on me and I was across the street!